What is the Joint European Torus and how does it work? The Joint European Torus, or JET, is a physics facility located in the Culham Centre for Fusion Energy in Oxfordshire. Plasma physicists and engineers there are producing thermonuclear plasmas under magnetic confinement in order to show that fusion energy is a reliable source of energy in the future. It is very difficult to do on earth as in order for nuclear fusion to happen temperatures millions of degrees above the core of the Sun must be achieved as it is impossible to gravitationally confine the plasma (CEA, 2001) – which is the way it happens in stars. A plasma is defined as a quasi-neutral ionised gas, and because it is charged, it can be manipulated by electric and magnetic fields (Suplee, 2009). JET’s history started in 1970 when the Council of the European Community decided to embark on a fusion research programme and build a European fusion device. After three years in 1973, the designs of JET were being drawn up and in 1977 the Culham site was chosen to build JET and construction work began. It then started operation in 1983 (United Kingdom Atomic Energy Authority, 2012). The 9th of November 1991 is a particularly important date in the history of nuclear fusion as this was when the Preliminary Tritium Experiment “achieved the world’s first controlled release of fusion power” (ITER Organization, 2014). Nuclear fusion is what powers the sun and it involves two nuclei fusing together under extreme temperatures and pressures. When this reaction occurs, energy is released from Einstein’s energy-mass equivalence equation This is because the sum of the masses of the individual nucleons before fusing is greater than the sum of the masses of the nuclei when they have fused. This leads to a mass defect and due to the conservation of energy; a loss in mass is compensated through the release of energy. With regards to nuclear fusion, a lot of energy is released, especially when compared with nuclear fission. We can compare the energy outputs of both nuclear processes through the concept of binding energy. Binding energy is the amount of energy needed to either remove each nucleon from each other within the nucleus or the energy needed to fuse the same number of nucleons to form the nucleus of an atom. 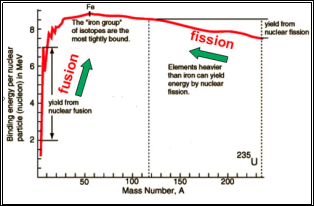 Looking at the binding energy per nucleon for the elements, we can see which are the most stable elements (they have the highest binding energy per nucleon) and see which processes (fission or fusion) releases the most energy. These pressures, as well as the high temperatures, and the effects of gravitational confinement means that the hydrogen atoms, which would normally repel one another due to their positive charges at the centres of their nuclei, are able to overcome the Coulomb barrier, and therefore the strong force is able to attract these nuclei together releasing vast amounts of energy and producing helium in the first place. The Coulomb barrier is the energy that is needed for the electrical repulsion to be overcome in order for the strong nuclear force to take place in order for the nuclei to fuse together (HyperPhysics). Here on earth, it is impossible to gravitationally confine large amounts of plasma, therefore physicists have developed two main methods for achieving nuclear fusion (for the purposes of civilian energy): inertial confinement and magnetic confinement (CEA, 2001). Another facility, the National Ignition Facility in Livermore, California uses inertial confinement and this involves the use of lasers. However, JET is concerned with magnetic confinement and, as the name suggests, it involves magnets with a reactor shaped as a torus or as a hollow doughnut. The Russian physicist Andrei Sakharov first came up with the idea of a tokamak as it was considered the most optimal shape to successfully confine a plasma using magnetic fields. Where is the plasma density, is the plasma temperature and is the confinement time. Within the tokamak, the plasma current is induced by a transformer. The central iron transformer core acts as the primary winding, and this is situated in the hole of the tokamak reactor, and the plasma acts as the secondary winding. The plasma can act as a secondary winding because it is electrically-charged and therefore acts as a conductor. The alternating current that is supplied to the central magnetic coil induces a changing magnetic field and this is used to control the plasma. This produces a heating effect called Ohmic heating. Thus induced current causes heating which also happens in conventional transformers as well. Neutral-beam injection involves the introducing high-energy atoms into the magnetically-confined plasma when it is already ohmically heated. These atoms are ionised as they pass through the plasma and therefore are also controlled by the magnetic field present. They then become high-energy ions and as a result, they transfer some of their energy to the plasma particles in repeated collisions. This increase in the number of collisions increases the average translational kinetic energy associated with these ions and thus increases the temperature of the plasma overall. Furthermore, radio frequency heating is also used to heat the plasma. This is generated through induction high-frequency oscillating currents in the plasma by external coils. There are parts of the plasma where the energy absorption is high and the frequencies are chosen to match the frequencies of these regions. This is called resonance and it allows large amounts of power to be transferred to the plasma. All of these ways of heating the plasma are important as not one single method can produce the necessary temperatures of 100 million degrees Celsius (United Kingdom Atomic Energy Authority, 2012), which is required in magnetic confinement (United Kingdom Atomic Energy Authority, 2012). 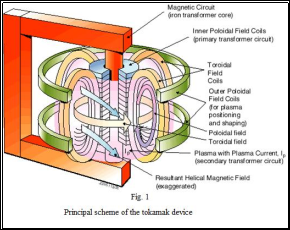 The main purpose of the tokamak in JET is to magnetically confine the plasma with the help of the device called a “tokamak” which is a Russian acronym for a torus-shaped magnetic chamber (European Joint Undertaking for ITER and the Development of Fusion Energy (‘Fusion for Energy’), 2013). 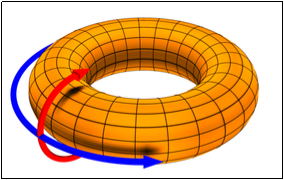 In order to successfully confine the plasma, the magnetic field lines must move around the torus in a helical shape generated by toroidal and poloidal fields. The diagram above is useful in explaining two key concepts in plasma physics: the toroidal field and the poloidal field. The toroidal field is represented by the blue line and it is the magnetic field that travels around the torus in circles. The poloidal field is represented by the red arrow and it travels in circles perpendicular to the toroidal field. Both of these fields differ in the way they are produced as well in their direction of travel. The toroidal field is produced by electromagnets which surround the torus, and the poloidal field is generated as a result of the toroidal electric current that follows inside the plasma with the help of a second set of electromagnets (Wikipedia, 2014). At the moment, JET can only produce around 70% of the power needed to heat the plasma in the first place (MlynáÅ™, 2007). However, a new tokamak called ITER is being built in Cadarache and developed in order to develop the technologies and obtain the knowledge necessary to built fusion power stations capable of producing more energy out than in (European Joint Undertaking for ITER and the Development of Fusion Energy (‘Fusion for Energy’), 2013). Energy production from fusion is a promising idea as a fusion reaction, in comparison to the combustion of fossil fuels, is four times more energetic, thus more energy can be produced from very small quantities of deuterium and tritium (ITER Organization, 2014). In practical terms, in order to produce 1000MW of electricity, 2.4 million tonnes of coal would be needed each year for a coal-fired power station, however only 125kg each of deuterium and tritium per year would be needed to produce the same amount of energy (ITER Organization, 2014). From the research conducted at JET, it was apparent to physicists that a bigger tokamak must be built in order to break-even and hopefully obtain a greater energy output than input. To reiterate, this tokamak is known as ITER and is currently built in the south of France. Even then, ITER is not being built specifically for energy production and it is only until DEMO will be built that it can be demonstrated to the world that it is possible to harness the power of nuclear fusion on energy. DEMO is expected to be running sometime during the 2030s and an actual fusion power plant to be running by 2050 (EFDA, 2014). However, due to inevitable geopolitical issues and financial constraints, there is every possibility that these dates may be pushed forward into the future. Even so it was in 1905 when Einstein first formulated the mass-energy equivalence relation, it was in 1920 when Eddington first discovered how stars produced energy, it was in 1927 when Langmuir gave “plasma” its name and thus plasma physics was born (MlynáÅ™, 2007); and there have been many other milestones within plasma physics since then that even if the dates fusion civilian energy is pushed forward by a couple of decades or more it will not mean anything in the long term as man will finally be able to “learn how to release it and use it for his service” – as Eddington said. Irrespective of when the production of fusion energy will occur, JET will have been a cornerstone in the history of fusion energy and plasma physics as experiments at JET have made us closer and closer to ignition. The next step is to build the next series of tokamaks and finally the fusion power plant. Irvine, M. (2011). Nuclear Power: A Very Short Introduction. New York: Oxford University Press Inc.
MlynáÅ™, J. (2007). Focus On: JET. Prague: Association EURATOM-IPP.CR. Suplee, C. (2009). The Plasma Universe. Cambridge: Cambridge University Press. "Strategies to Produce Thermonuclear Plasmas." UKEssays.com. 11 2018. All Answers Ltd. 04 2019 <https://www.ukessays.com/essays/physics/strategies-produce-thermonuclear-2327.php?vref=1>. "Strategies to Produce Thermonuclear Plasmas." All Answers Ltd. ukessays.com, November 2018. Web. 20 April 2019. <https://www.ukessays.com/essays/physics/strategies-produce-thermonuclear-2327.php?vref=1>. UKEssays. November 2018. Strategies to Produce Thermonuclear Plasmas. [online]. Available from: https://www.ukessays.com/essays/physics/strategies-produce-thermonuclear-2327.php?vref=1 [Accessed 20 April 2019]. UKEssays. Strategies to Produce Thermonuclear Plasmas [Internet]. November 2018. [Accessed 20 April 2019]; Available from: https://www.ukessays.com/essays/physics/strategies-produce-thermonuclear-2327.php?vref=1.